Thursday, February 7, 2013 ratings — New Episodes: Community, Parks And Recreation, The Office, 1600 Penn, Do No Harm, The Big Bang Theory, Two And A Half Men, Person Of Interest, Elementary, Grey’s Anatomy, Scandal, American Idol, Glee, The Vampire Diaries, and Beauty And The Beast. Episode Reruns: Shark Tank. 8pm – Shark Tank: (rerun) 1.3 in the demo with 4.78 million. 9pm – Grey’s Anatomy: 3.1 in the demo (+11% change) with 8.82 million. 10pm – Scandal: 2.8 in the demo (+4% change) with 8.00 million. 8pm – The Big Bang Theory: 6.1 in the demo (+13% change) with 18.85 million. 8:30pm – Two and a Half Men: 4.1 in the demo (+5% change) with 14.15 million. 9pm – Person of Interest: 3.2 in the demo (0% change) with 15.16 million. 10pm – Elementary: 2.3 in the demo (+5% change) with 11.02 million. 8pm – The Vampire Diaries: 1.1 in the demo (-15% change) with 2.50 million. 9pm – Beauty and the Beast: 0.6 in the demo (-14% change) with 1.52 million. 8pm – American Idol: 4.1 in the demo (-9% change) with 13.15 million. 9pm – Glee: 2.2 in the demo (+5% change) with 6.06 million. 8pm – Community: 1.8 in the demo with 3.98 million. 8:30pm – Parks and Recreation: 2.0 in the demo (+18% change) with 3.83 million. 9pm – The Office: 2.1 in the demo (+11% change) with 4.25 million. 9:30pm – 1600 Penn: 1.1 in the demo (-15% change) with 2.81 million. 10pm – Do No Harm: 0.7 in the demo (-22% change) with 2.18 million. What were you watching last night? 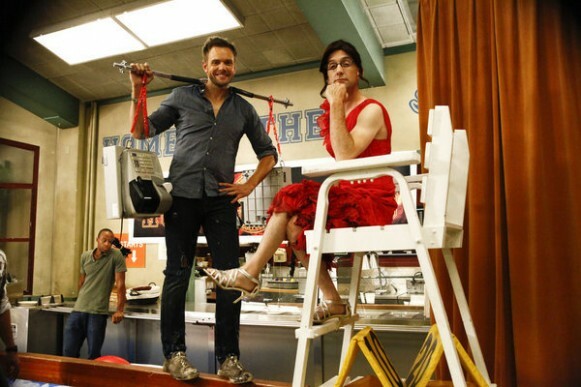 The return of Community, other new episodes, reruns, or something better? I love Elementary and I am glad that it is doing well, but I like Vegas too. So, please explain to me why Vegas is courting cancellation and Elemenary is sure to be renewed. The numbers for both are almost the same. I like Do No Harm, but based on the ratings I won’t get to see all 12 episodes.